Essteele Australis 20cm/3.4L Covered Casserole is rated 5.0 out of 5 by 3. Rated 5 out of 5 by Shayne from Beautiful to use and look at This pot is beautiful to just look at. I had trouble using it the first time but I must say after quite a few years of use it still looks amazing. I like to do my mash in this pot and serve it up in the pot! Rated 5 out of 5 by Llyris from Isn't it nice when something just works! I bought this just 2 or 3 weeks ago and it's my new favourite pot. The size is good for a 4 person casserole. It works beautifully on the stove (I haven't tried it in the oven yet). The base is heavy, it conducts well and evenly, and is more responsive to changing heat source than I was expecting. I procrastinated about buying this for months, bought a cheaper saucepan instead, then came back and bought this one. Don't. Just buy this one, it's worth every cent. 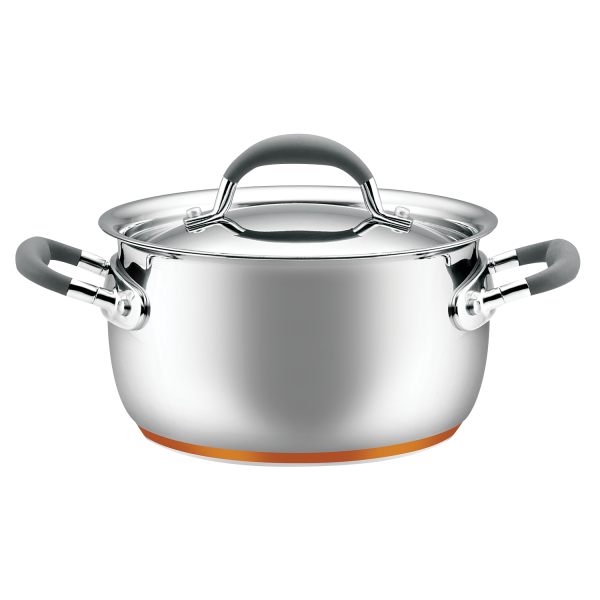 Rated 5 out of 5 by piscean from Love mine I have this Australis stock pot and it is my favourite piece of cookware. Soups, stews, pasta sauce, curry, chilli con carne all get cooked in mine. The heat distribution is fantastic, and nothing ever really sticks to it so clean up is easy. Over time I plan to replace all my cookware with this series, it's truly a joy to use in the kitchen.